I was a huge fan of the New York Mets when I was growing up. I have every baseball card made from 1984-1988 and a ton of memorabilia of the Mets. A hero of mine was Gary Carter who wore number 8 and played catcher for the Mets. I wrote to him as a kid and he wrote me back and sent me autographed card. In May of 2011 Carter was diagnosed with an aggressive case of brain cancer known as glioblastoma multiforme. He lost his battle with cancer on February 16, 2012. The 57-year-old was married and had three adult children. I had found Carter’s address a few years before he died, before he was diagnosed with cancer, and I thought I would write him a note to let him know how much I looked up to him as a young person. I put it off and sadly he died before I ever sent the letter. As we get close to the anniversary of Carter’s passing I thought I would write his daughter Kimmy a note. I’ve struggled around the anniversary of my mother’s death and find comfort when people reach out to say something nice about her. Hopefully my letter to Kimmy will brighten her day to know how much I admired her father. As a kid, your father was my hero. 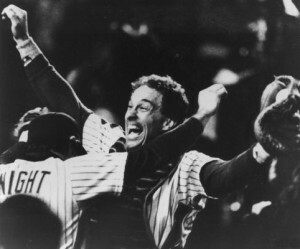 I was 12 when he led the New York Mets to the 1986 World Series victory against the Boston Red Sox – in fact my Dad took me to the NLCS Game 5 where your father hit a single up the middle off of the Astros’ Charlie Kerfeld in the bottom of the 12th that scored Wally Backman to win the game. It was truly amazing. As an adult, I learned about your father’s work ethic and unwavering character. His comments at the the 2003 Hall of Fame induction touched my heart. I imagine that this time of year must be tough for you and your family but I hope that somehow it is comforting to know that he is remembered fondly by so many – not only as a Hall of Famer on the field, but as a role model off the field as well. 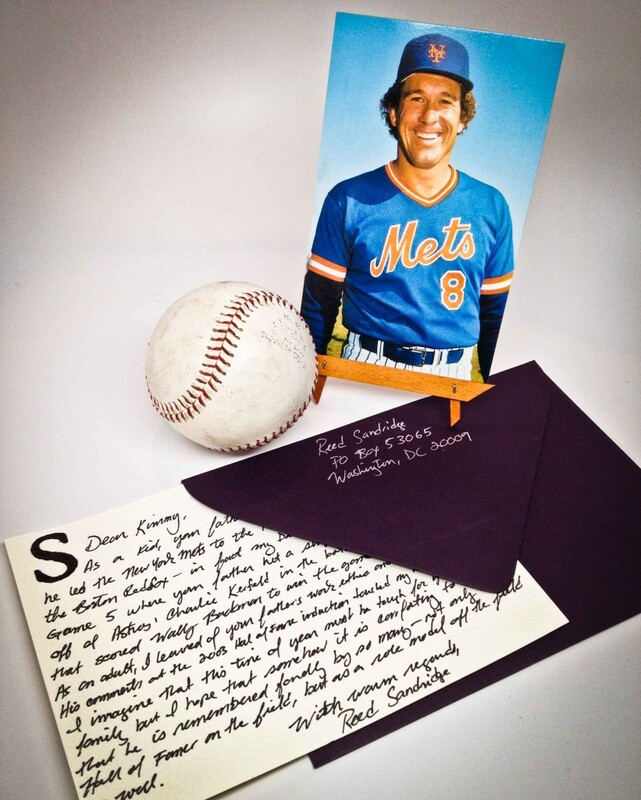 This entry was posted in Just because and tagged 1986, Aubergine, baseball, embossed, fans, Gary Carter, Gelly Roll Metallic, handwritten, heroes, Kimmy Bloemers, letters, Mets, paper, Paper Source, photographs, sharpie extra fine, sports, stationery, World Series, Year of Letters. Bookmark the permalink.